Multiple Sclerosis (MS) is a chronic, potentially debilitating neurological disease affecting the brain, brain stem and spinal cord. More than one million people around the world are affected by MS. It is an unpredictable disease and varies in severity, from a mild illness in some to permanent disability in others. Symptoms typically begin between ages 20 and 40, and often include feelings of numbness and tingling in the arms and legs, difficulty walking, impaired balance, muscle weakness, visual disturbances and memory loss. Women are diagnosed 2:1 compared to men, but the reason for this currently is unknown. The regenerative process of MS is called demyelination. It is the destruction of a fatty substance, called myelin, which coats and protects nerve fibers. 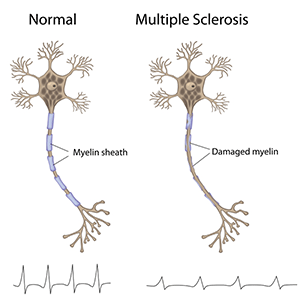 In patients with MS, the body wrongly destroys the myelin sheath that surrounds the nerves. The myelin becomes inflamed and swollen and detaches from the nerve fibers. In its place, firm or hardened (sclerosed)patches of scar tissue form. This damage eventually causes interruptions or blockages of nerve signals from the brain, brain stem and spinal cord. New and relevant research on upper cervical care has demonstrated a correlating link between MS and the upper cervical spine. Although upper cervical care is not considered a cure for those with MS, studies are finding tremendous benefits for those suffering with the disease. A thorough evaluation by a specialized upper cervical doctor can determine whether careful upper cervical corrections can help a patient with multiple sclerosis.